Major League Baseball has made an effort to grow the sport among African-Americans, and there are finally some small signs of progress. Meanwhile, ballparks from coast to coast host nights celebrating the LGBT community, another example of baseball's attempts to promote diversity. Right now, all of that is being overshadowed after the discovery of some inflammatory old tweets from current players, social media posts that threaten to undermine some of the work MLB has invested in. 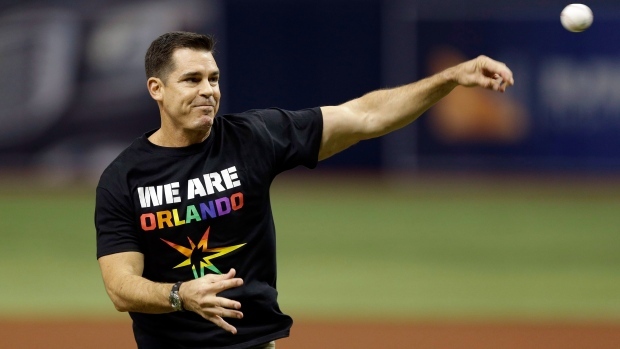 "I think the main challenge is that a lot of times good deeds are not as interesting as misdeeds," said Billy Bean, MLB's vice-president for social responsibility and inclusion. "We've worked so hard to not only introduce the sport in underserved areas and grow our Play Ball initiative, our Breakthrough Series -- our RBI program is in its third decade. The number of kids that we're putting uniforms on and introducing to the sport at a younger age -- that definitely gets pushed to the wayside when (there is) something as controversial as a tweet that contains racist or misogynistic or homophobic language in it." Whatever progress baseball has made promoting inclusion, it took a backseat recently. Years-old racist, misogynistic and homophobic tweets from Milwaukee reliever Josh Hader were found during the All-Star Game. Then Atlanta pitcher Sean Newcomb and Washington shortstop Trea Turner had their own offensive tweets unearthed. The tweets were from well before those players reached the major leagues, but they raised uncomfortable questions for a sport still trying to increase participation among African-Americans. "I strongly believe people are going to move forward," Oakland slugger Khris Davis said. "There's never an easy answer. I think Major League Baseball's doing a fine job promoting baseball to black players." Davis' father, Rodney, has done some work for the MLB Urban Youth Academy, and the younger Davis played for a travel team affiliated with the Academy. Programs like that received credit when MLB said the percentage of black players from the United States and Canada on opening day active rosters rose to 8.4 per cent this year . That's the highest level since at least 2012, but still well below the percentage from the mid-1980s. A report around the start of the season found the sport was showing improvement with racial and gender hiring practices. A team made up largely of black players from Washington's Mamie Johnson Little League qualified for a regional tournament in Connecticut recently -- a feel-good story for baseball in the aftermath of the offensive social media posts. The league began operation just a few years ago and has partnered with the Washington Nationals' youth academy. Keith Barnes, the league's president, said he didn't think the kids were paying too much attention to the controversy over racist tweets. He certainly doesn't think it will affect their enjoyment of the sport. "I think most of the work has to be done at the grassroots level to bring kids to the sport," Barnes said. "I don't think it's more on the major league level. It's more imperative that the community drive kids to play the sport." Still, young athletes look up to major leaguers, and incidents like these can be damaging. Even before the tweets surfaced, a well-known major league pitching coach was fired for comments he made to a team employee. Chris Bosio, who was with the Detroit Tigers, later told USA Today he used the word "monkey" -- but insisted he didn't say it in a racial or demeaning context. Earlier this year, Jackie Robinson's daughter said she thought black baseball players were more reluctant to speak publicly about racial issues because they constitute a lower percentage of rosters than in some other sports. Dodgers manager Dave Roberts said to him, the biggest lesson from the Twitter revelations was that actions have consequences. "I don't think it's a cultural problem. I think there's always something more that we can all do as individuals," Roberts said. "We all, in uniform, have a platform and opportunity to build people up. I can't speak for every individual but I know that I try to choose my words wisely and really try to lift people up, whatever their race or sexual orientation is." Bean wants to make it clear that this issue isn't just about the perils of social media. "We need to get to the core of why young men find humour in disparaging comments. I think that that is something that permeates through every household across the United States," said Bean, who came out as gay in 1999, four years after the end of his major league playing career. "The idea of just telling them to hurry up and delete an account, that's not finding a solution. That's perpetuating a situation that we want to eliminate 100 per cent throughout the sport." Bean said it was a "terrible day for baseball" each time more offending tweets were revealed -- and the message organizations send to their players and fans is important. "If this date in time is remembered for one of the most unfortunate weeks where it comes to baseball's relationship with social media and that of our players, sometimes you have to roll up your sleeves and try to find the best outcome moving forward," Bean said. "If it can make everybody take a beat and realize just how damaging those words can be to the fans that look up to our players, then maybe it will be a learning experience that none of us will ever forget."